This unique natural history exploration of Florida by members and correspondents of America’s first research natural history museum, Philadelphia’s Academy of Natural Sciences, reveals the science of discovery and collection of unknown plants, animals, fossils, and artifacts of ancient peoples. 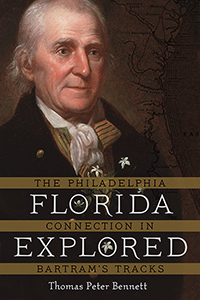 The early naturalists, Thomas Say, Titian Peale, Thomas Nuttall, John James Audubon, John LeConte, John Torrey, Hardy Croom, Alvan Chapman, Asa Gray, Clarence Moore, Henry Fowler, Henry Pilsbry, Francis Harper, and others were inspired to explore Florida in the tracks of William Bartram, the colonial explorer of British East and West Florida and author in 1791 of TRAVELS. The godfather of the Academy, Bartram was elected to membership shortly after its founding in 1812 by his students. The discoveries and collections, new plants and animals, fossils, and artifacts of ancient peoples, made by Bartram and those who followed him created databases for research and understanding Florida’s natural heritage, current, and future ecosystems. Written in the narrative style, notes provide annotations and details for novices and academic references for students and scholars interested in specific areas such as botany, ornithology, and Florida natural history. Long before the rise of mass tourism, Florida was another kind of "Magic Kingdom," luring plant collectors and other naturalists to explore the richness of its flora and fauna. In his thorough environmental history, Thomas Peter Bennett lays out nearly three centuries of scientific expeditions focused on the Sunshine State. In addition to the scientific aims of these parties, the book weaves together the personal relationships of succeeding generations of scientists who return to the same landscape to add their own imprint and interpretations upon it. As a result, the book will appeal not only to historians of science but also to a wide audience interested in Southern environmental history.